What's All This Fuss About 2012 ? The Maya Had A Calendar & They Weren't Afraid To Use It! HOW DID THE PRIMITIVE MAYA COME TO HAVE SUCH A CALENDAR? WERE THEY WITNESSES TO THIS MECHANISM OR THE CREATORS OF THIS TECHNOLOGY? If all this sounds familiar; it is. We find the same inconsistencies all over the world. Egypt, Cambodia, India, etc., the list goes on. The mechanism the of the Mayan calendar is shown in the picture featured on this page. This calendar mechanism used quite complex cycles of the Sun & Venus to let the Maya know not only what they could expect in certain years or months or weeks...BUT...also; just when to watch out for when the Earth could expect to experience some of its "regularly scheduled cataclysms". The Maya, you see, had been informed that every so often, their planet "Earth" would experience all kinds of Natural Disasters from time to time. These Disasters could be so huge, that mankind would have to "start civilization over...from scratch". And, if they wanted to survive such events; they needed a Calendar that would help them survive. They needed to know When & How to "take shelter" in order to survive. One of these occurrences is said to be Noah's flood as mentioned in the Bible. According to the Maya the Earth is presently in its "3rd Age" & is soon to give birth to its "4th Age". Now as it just so happens, the Winter Solstice of the Year 2012, will in fact, occur at the moment when our Sun is passing the exact center of our Milky Way Galaxy. And, coincidently, the Mayan Calendar itself...[a calendar that began on 11 (or 10) August of 3114 BC ] does in fact END on the Winter Solstice of 2012 AD. After that there are no more days. The "gods" came to earth and tired of the daily labour they had to engage in...so...they decided to create a "being" or "servant" to do their work for them. (Zechariah Sitchin tells us the "gods" needed help to mine gold...which the "gods" found too "labor intensive". These "gods" encountered all sorts of problems in their endeavor. What finally worked was the mixing of their own DNA with the creature they were forming...and they eventually came up with "Man". Men wanting to reach the abode of "god" was seen as something to be prevented before it was completed. To deal with this unexpected dilemma, the "gods" decided to start over & limit Man's abilities. What were the new limitations? This new man was now limited in either his intelligence level, his natural abilities, or both. The Popul Vuh recounts that as a result of the work of these "gods", there were at first, may races on the earth...black, white, yellow, & brown...and that they spoke many languages. The Popul Vuh states that people had different specialties & qualities; but all the people were attractive and well spoken. The Popul Vuh also tells us that something happened to end this world as well as other worlds that were also subsequently created. In fact; before this present day "world" came into being, at least three previous worlds were both created and then destroyed. "Unattainable is the bread in Katun 13 Ahau. The Sun shall be eclipsed. Double is the charge of the Katun: men without offspring, chiefs without successors. For five days the Sun shall be eclipsed, then it shall be seen again. This is the charge of Katun 13 Ahau"
NOTE: Ahau is the last day or 20th day in a Mayan 20 day month. A Katun is 7,200 Days Long. The Mayan Calendar begins in 3114 BC. If it Means  Katun 13, Ahau: with Ahau being the last day in a Katun ... meaning the end of 256.2628 years... then it means the 93,600th day. "...the Katun is named (gets its name) for the day on which it ends. Thus a Katun #13 ending on Ahau would be called: Katun 13, is 'named' Ahau. 511 AD - 768 AD - 1024 AD - 1280 AD - 1536 AD - etc until we get to 2054 AD .. not 2012. So: Is the "prophecy" given in the book accurate for those years? Or is the prophecy reserved for some greater cycle that also falls on that date but only in a given year? NOW, WHAT ABOUT THE SUN'S CROSSING THE GALACTIC CENTER? The Sun actually crosses the Galactic Center on Dec. 18, 2012 at 13:13:09 GMT. BUT, it is not yet, at one of the important "event" points in Astrology...the Capricorn Ingress (When the Sun actually enters one of the 4 Cardinal Signs). The Sun should cross the Galactic Center during one of the "Great Alignments". This is when certain Cyclical Patterns form in the Heavens. What we are actually left dealing with in terms of the possibility of something out of the "ordinary"
Ancient texts from the American Indians, Greeks, Indians, Aztecs, Incas & even Egyptian & Hebrew traditions all speak of what mankind was like at one time, and; what later became of him & this planet he called home. Some, like the Inca & the Aztec say there have been four worlds before and our present world is the fifth. The ancient texts speak about people that were giants and some that "degenerated" into monkeys. The ancient stories tell of people who died out from hunger while others were wiped out by Flood. Great Winds, while another world was said to be destroyed by Fire. NOTE: I recommend looking into the different translations of the Popul Vuh itself and see for yourself what to conclude. So, Is the World Going to End or What? 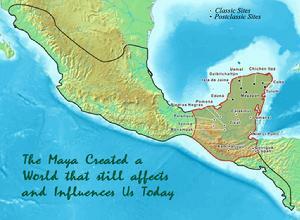 People seem to "reason" that the Maya might have known something about how things work on Planet Earth. How they came to know it, is another matter. And, what about this Present World? How do the Maya say that it Ends? Why, with Earthquakes and a Shifting of the Planet. The Ancient Texts say that at some point each "Age" comes to an end...as often as it says each "World" comes to an end. Question: If the "gods" ended some of those worlds on purpose, then which of these world-ending events were due to the intervention of the "gods" and which were the result of some re-occurring Natural Cycle...and...how to know for sure which was which; and how to know which we might expect to occur again? So every now & again, our planet seems to undergo some sort of change to the extent that very little remains of the "ways things were". But, at the same time, "things" do go on, or we wouldn't still be here today, would we? The Maya did not use a "20 based number system"
on Stela 10 at Tikal; 8 or possibly 9 periods are indicated ... showing 1, 841, 639, 800 days. Thus, the number of days having elapsed by Dec.21, 2012 (1,872,000) is not as far as the Maya could or did "count"; thus it would not be the "end" of their calendar ... at least not numerically. Regarding Precession: The Earth was aimed at Taurus during the time of Apis Bull worship in Egypt when Thebes was its centre of power. The Earth was pointed at Aries when Luxor worshipped the Ram. Then, Pisces the Fish became predominant in worship during the Christian Period. Next will be Aquarius; but when exactly it begins is in dispute. However ... The time of Aries occurred about 2150 years ago and is not due for another 23,650 years. In other words, the Earth is pointing where it is and where it does only as far as we now know or believe we know. But its beginning could not be Aries. Aries may have marked the beginning of something for someone in the past... but that is all. The Milky Way Galaxy is a BIG place. It would take one heck of a ruler to know exactly where the "centre line" of the Galaxy and the resulting "plumb line" through our Solar System would actually be. The Maya knew ... or were told ... something about a certain set of "cycles" that occur & re-occur and were told to either watch out for those cycles or to preserve the knowledge of those cycles for future reference. When all is said and done; we really don't know more than that. It would be logical to presume that cycles affecting life here on earth could be one reason: IF there were certain cycles that needed to be planned or provided for, by those living on this planet ... during those cycles. OR: It could be that those cycles indicated something "extra" terrestrial that also had to be planned or provided for. "different from you or me"
The "Comalcalco Brick," as the second fragment is known, is a definite reference to Dec. 21, 2012 or Dec. 23, 2012. The date inscribed on the brick coincides with the end of the 13th Baktun; The Mayan Long Count calendar begins in 3114 B.C., and the 13th Baktun ends around Dec. 21, 2012. The third glyph on the brick seems to read as the verb huli, "he/she/it arrives." Both inscriptions � the Tortuguero tablet and the Comalcalco brick � are thought to be carved about 1,300 years ago. (1) The Tortuguero inscription describes something that is supposed to occur in 2012 involving Bolon Yokte, a god associated with both war and creation. Though the end of the message is eroded due to a crack in the stone; it is thought to read: "He will descend from the sky." Monument 6 from Tortuguero depicts the end of the current 13-Bak'tun era in 2012. It states that then, ��utom, �it will happen� then an unreadable part, then "he will descend" (apparently accompanied by some nine "helpers") "The Thirteenth Bak'tun" will be finished (on) Four Ahaw, the Third of K'ank'in. ? will occur. (It will be) the descent(?) of the Nine Support (?) God(s) to the ?. (2) Also of interest is that the Comalcalco bricks were designed to be read only from the inside ... meaning unless you could be "inside the room they were in" you couldn't read their message. They are fired-clay bricks held together with mortar made from oyster shells. The use of bricks at Comalcalco was unique among Maya sites, and many of them are decorated with iconography and/or hieroglyphs. 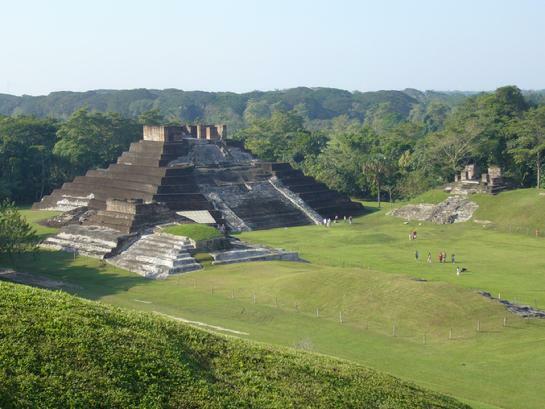 Comalcalco is the most western of the known Mayan cities. TO RETURN TO TOP OF PAGE: "CLICK HERE"
TO GO TO 2012 CHARTS: "CLICK HERE "
TO RETURN TO MUNDANE EVENTS: "CLICK HERE"
IS THERE A PLANET "X"? - "CLICK HERE"
TO RETURN TO "EARTH SHIFT?" "CLICK HERE"